Exactly, since it’s more than an outdoor suit and a mere sleeping mat. It’s something else; a whole new breed of adventure gear. For thrill-seekers who prefer frigid climes, a Chilean graphic artist has conceived the ultimate in outdoor wear. It’s called a Selk’Bag after an indigenous Andean tribe. What it does is insulate the wearer from the bone-aching cold while also doubling as a sleeping bag. Even though wearers can be mistaken for yetis in brightly colored fur while donning this, the Selk’Bag is a practical form of attire that doesn’t sacrifice convenience. There are quick release outlets on each arm to let the hands out. When the wearer wants to sleep though, it’s easy to button down and curl on the ground. The Selk’Bag is fundamentally a sleeping bag with limbs. The soles of the legs are also non-slip padded for a decent grip on bare ground. And if you want some style, the creator posits several sizes and colors available, and even a kiddie version, too. It would be cool if the Selk’Bag line can incorporate features of a ghillie suit and webbing familiar to mountaineers. That way, more equipment and stuff in general can be brought by the wearer. 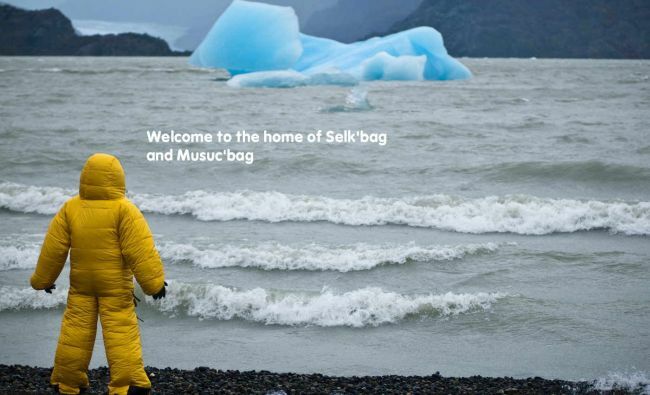 The Selk’Bag is already available in outdoor retail establishments and sells for $149.